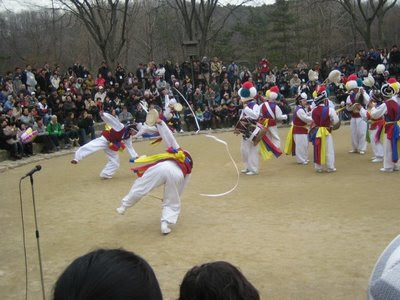 On Saturday we went to Korean Folk Village. It sounds like a cheesy amusement park type of place, and probably would be in America (i.e. Tombstone, Arizona) but they do a good job of giving off an authentic feel while maintaining accessibility. They basically transplanted a bunch of traditional homesteads from the countryside, ranging from peasants' straw-roofed houses to noblemens' sprawling estates (complete with concubine quarters). They have also employed a lot of artisans to demonstrate and sell traditional (many of which could also still be considered contemporary) artifacts like straw baskets, silk garments, and forged iron tools. 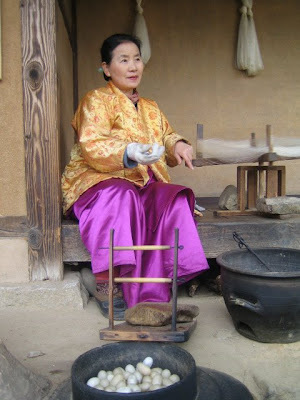 This woman was in one of the peasant's homes, spinning silk into thread from silk worm eggs. It was fascinating. She was boiling several dozen eggs at a time, and would stir it with chopsticks to draw up the threads, which loosened from the heat. She strung them through a small hole in the opening of the wooden apparatus at her feet, through her hands, where she funneled them into a single thread, and onto the spinning contraption to her left, where the thick, firm threads were wound into a skein of silk. One of the Korean guides said something to her and she picked up one of the eggs with her golden chopsticks and pierced it, pulling out a small golden brown silk worm larvae. She offered it to me in her palm. I motioned towards my mouth, asking if it was for me to eat, and she nodded. So I ate it. It tasted much like you would expect a stewed bug to taste, with very little crunch but a slight, unpleasant aftertaste reminiscent of moth balls. Apparently silk worm larvae are a popular snack among Koreans. The whole park was very tranquil. 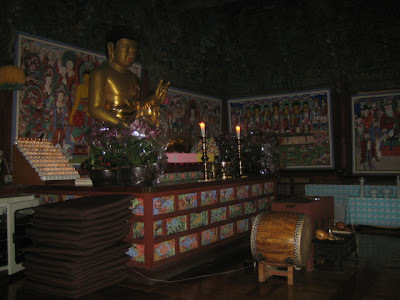 There was a Buddhist monastery complete with an actual practicing monk. 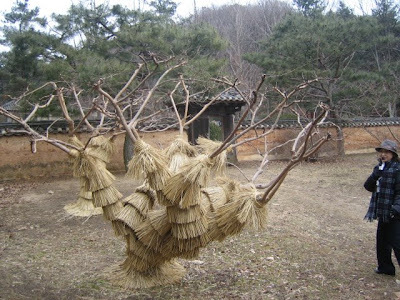 Many of the trees were wrapped with what looked like straw leg warmers, which is, in fact, what they turned out to be. The guide told us that the trees would get cold and die without their booties. 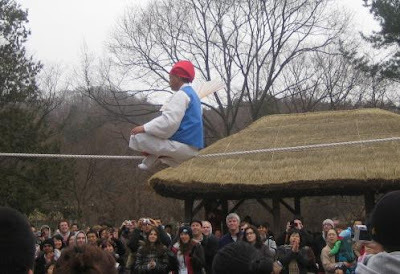 The biggest attraction for us was the performances in the afternoon - traditional farmers' music, a tightrope exhibition, seesaw acrobats, and equestrian feats. I was particularly interested in the tightrope act, since we had just seen some pretty impressive moves in the King and the Clown the night before, and I thought they would be even more impressive in person. Indeed, I wasn't disappointed. The musicians, led by an old chubby man who never stopped grinning, beat a variety of drums while dancers marched around them with long tassels attached to a rigid stick on their hats that would spin as they turned their heads. They all had seemingly boundless energy. 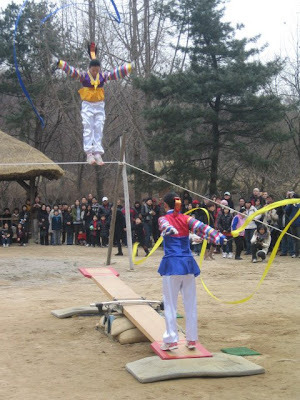 The acrobats were two very petite girls who, despite their diminutive size, would send each other flying on the other end of the seesaw with every jump. They mimicked each other in the air, beating drums or doing flips. 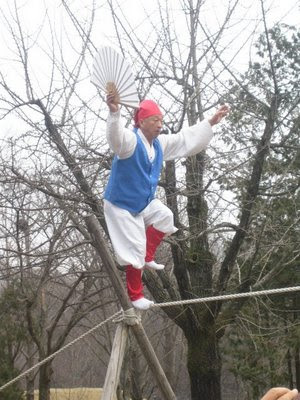 The highlight for me, though, was definitely the 70 year old man on the tightrope.He would flutter his fan and walk or run or bounce across the rope. He made it look really easy. One of the annoying things about EPIK orientation so far has been doing everything with 400 other people. When we all got back on the 10 buses to take us back to Dankook University, we were told that one person was missing, so we had to wait. 30 minutes later we left, supposedly without him. Later, Lisa and I sat with him at dinner. Turns out he was on the bus the whole time, fast asleep.